I was hoping someone had some more info on this, it would be much appreciated. Thanks! I'm having this issue with my 2014 LT. It happens only in the cold weather and is a very loud squeaking noise when turning the wheel both ways. Brought it in 2 different times and they're never able to reproduce the issue. I will be bringing the vehicle in a third time very soon since it's cold out and leave it overnight. It should squeak real loud the following morning when starting the car. I didn't know there was a bulletin for this issue; I will be bringing it with me. Thanks for the info! Any updates regarding the issue with your car? I do not have any additional info, i was hoping someone would chime in, like Doug. Very knowledgeable. Mine squeaks when cranking to the right, and as you mentioned it's only when my vehicle is cold. When it warms up it goes away. Wow, same problem with my 2016 Impala LTZ. Thanks for posting this! I've worked on both ends of the steering column - I've disconnected it at the rack, and pulled the wheel off at the other end. Other than installing a blinker switch, I haven't really gotten very far into one. That said, if I was chasing a squeak, I'd try to get under there when it's doing it, and see if the source location can be pinpointed. After that, it's either a matter of applying lube, or slightly repositioning that object that's rubbing. I do not have any additional info, i was hoping someone would chime in, like Doug. Very knowledgeable. BTW, there are some really sharp folks who post here from time to time who know way more about Chevys than I do. And they have also been very helpful to me as well. Ill look into my car when i get time and update the thread for anyone else curious. It seems to be loudest just above the airbox(passenger side). Thanks Doug, the input is very much appreciated. You just seem to be the most active here giving input on multiple threads that seem to be very insightful. Ill update sometime when i get to it! It seems to be loudest just above the airbox(passenger side). You hear the noise when you turn the wheel, but it's not coming from the steering column? I missed that. You think it's coming from outside the passenger compartment? I'm wondering if it's something in the rack or inner tie rods. Does this car have electric power steering? If so, there's a motor on the rack that could be a factor in the noise. If the noise is in the engine compartment, identifying it will be a bit tougher, as in maybe needing to be under the car when it's squeaking. But you can start with opening the hood and listening near the firewall for the squeak. Here is a picture to better explain. When i have someone crank the wheel to the right this seems to be where i hear the most noise from outside the vehicle, yet i can still hear it inside turning the wheel myself. The sound is more of like a stretching rubber sound if that helps narrow a bit. And yes it is electronic power steering. It is a 2014 2ltz. Thanks! Last edited by JaelenK; 01-08-2019 at 06:42 PM. Certainly very, very helpful information. This is my very first car so I'm still learning about it! Here is a picture to better explain. When i have someone crank the wheel to the right this seems to be where i hear the most noise from outside the vehicle, yet i can still hear it inside turning the wheel myself. And yes it is electronic power steering. It is a 2014 2ltz. Thanks! 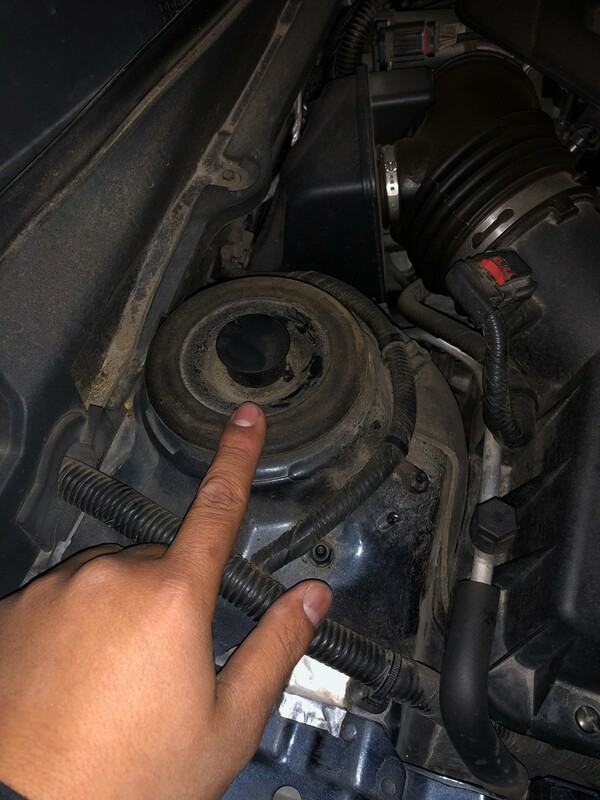 If it's coming from where your finger is resting, that's the upper strut mount. It has a bearing in it that allows the strut to turn smoothly with the steering. How many miles do you have on the car? You might can lube it. but even that may require removing the strut from the car - I'm not sure. The strut mount may need replacing, or at least the bearing in it. That requires removing the strut and partially disassembling it. I poked around on Rockauto. They have pretty slim pickings for front strut mounts for this car. If you order one, be sure it includes the bearing. I suggest looking around several auto parts websites to see what's out there. In doing so, from the various pics that come up, you'll get a pretty good idea of what all is in the strut stack. Interesting that Doug says the strut mount has a bearing which moves with the steering. My 14 Impala 2LT is currently at the dealer for this exact issue. In very cold weather, the steering creaks and groans through the full turn whether the car is stopped or not. They told me the upper strut mount needs replacing as well as the steering shaft seal. I brought the car to them before my CPO bumper-to-bumper expired but they couldn't reproduce the issue. Now that I'm 3 months past the bumper-to-bumper, they are trying to charge me almost $1,000 for the fix. I'm fighting it and they said the request was sent to the district office to see if it can be covered. I have no idea why this wouldn't be covered since it's been an issue brought up before my bumper-to-bumper expired. UPDATE: So the car came back from the dealership. They replaced the steering shaft seal and the upper strut mounts. Chevy covered the repair but I had to pay a $200 deductible.